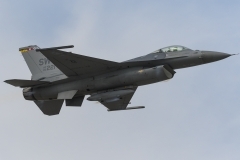 The skies over North Kingstown once again played host to some of the rock stars of the airshow industry for the 2018 installment of the Rhode Island National Guard Open House at Quonset Point. 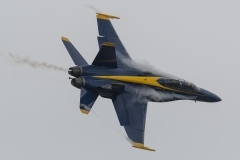 This year’s show was held June 9th and 10th, and featured the long awaited return of the US Navy Flight Demonstration Squadron, having last performed at the show in 2015.
the festivities. Thanks to the runway configuration, the Rhode Island airshow is known throughout the Northeast as one of the most photographer friendly locations, largely due to the taxiway running down the crowd line, the sea air providing plenty of potential for vapor, and the spectacular light during the second half of the show day. The gates opened to the public each day at 0900, and after the dust from the stampede cleared a handful of static displays were on hand to pass the time prior to flying kicking off. While airshows in general have had static displays taper off since the sequestration years, the organizers did a decent job of bringing in some less common aircraft for fans to check out. 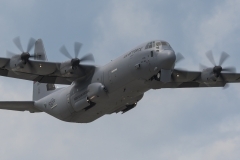 In addition to the locally based C-130J and Blackhawks, a P-8 Poseidon, E-2C Hawkeye, KC-135 Stratotanker, and a DC-3 were on hand as well as the former Quonset Air Museum F-14, a T-6 Texan II, and a smattering of General Aviation aircraft. As the sun climbed higher in the New England sky the show was opened in traditional Rhode Island Airshow fashion. Following a prayer, the US Naval Academy Parachute Team descended into show center trailing red smoke under red, white, and blue canopies. 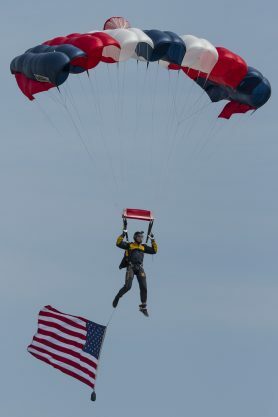 The final jumper was flying the stars and stripes, and had a perfect stand up landing soon after the final notes of the Star Spangled Banner echoed over the hushed show grounds. 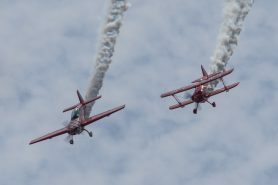 Mark Murphy and Charles Lynch began the flying portion of the show with a missing man formation for a member of the airshow family who was lost less than two weeks before the show. 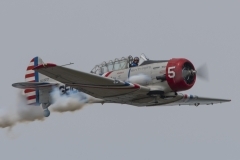 While en-route to another airshow, Ken “Ragnar” Johansen, Skytyper 3 and the team’s Executive Officer, was killed in a crash shortly after takeoff from Long Island’s Farmingdale airport. Ragnar was the flight lead during my orientation ride with the team last year, and NYCAviation has always had an affinity for our hometown airshow team. The loss hit the close knit airshow community hard, particularly the Skytypers who are truly a family of dedicated professionals. Johansen was born at Quonset Point and was a Naval Academy graduate. He retired from the Navy as a Commander and had an aviation career spanning decades. Ken left behind a wife and two kids and will be missed by friends, family, fellow aviators, and airshow fans alike. This article and the photos that accompany it are dedicated to his memory. In remembrance of the members of the greatest generation who gave their lives defending the country, Mark Murphy in the P-51D “Never Miss” was joined by Charles Lynch in the TBM-3 “She’s the Boss” for a short tribute demonstration. “Never Miss” is a regular sight at Quonset Point, and it was a treat to see and hear the Murphy family Mustang in formation with the massive TBM for a series of passes that brought history to life. With the first warbird performance out of the way, a pair of aerobatic teaser acts were up next. Michael Goulian dove into the box first and tested his G tolerance with a series of figures in his stunning blue and silver Extra 330SC. 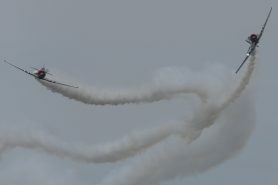 The current leader of the Red Bull Air Race World Championship has certainly kept up his airshow act as well and had no issue wowing the crowd with this abbreviated demonstration. 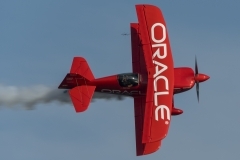 “Oracle Flight” was the next act cleared into the box as Sean Tucker in the Oracle Challenger III biplane joined John “Johnny D” De Gennaro in the Oracle Extra 300L for an incredible formation aerobatic act. Sean is in his last season as a solo performer, and has hinted that a formation act is in the cards for the 2019 airshow season and beyond. Tucker and De Gennaro flew their dissimilar aircraft in a rock steady formation of graceful loops and rolls before separating and trading off box time to show off the more extreme capabilities of their respective aircraft. Like Goulian, this was merely a warmup for Tucker, who would return to the box later in the afternoon for his full demonstration. An incredible photo pass from “Buzz” in Ace Maker! Greg Colyer’s Ace Maker made a return to Rhode Island after two consecutive appearances by Ace Maker II. 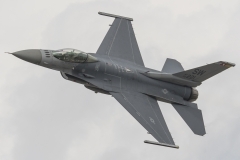 Due to an increased schedule, “Wired” has handed off the controls of Ace Maker to former TACDEMO pilot Shaun “Buzz” Roessner and Tim Tibo for the East Coast T-33 appearances, both of whom flew in Rhode Island. The Ace Maker demonstration is made up of 11 passes from the sleek classic jet trainer including a slow and dirty pass and a gorgeous photo pass. Due to the relatively primitive turbine engine technology of the T-33, it is critical that the pilots manage the energy of the aircraft to ensure that sufficient airspeed is available for the maneuvers. 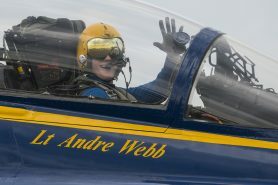 Each of Ace Maker’s pilots flew one demonstration on Saturday, including the slot immediately proceeding the Blue Angels with a jet powered warmup for the Blue Angels! 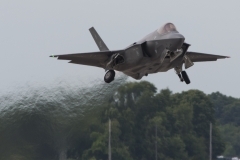 Shockwave speeding down the Quonset Point runway. This year’s appearance by Shockwave thrilled the crowds as usual. 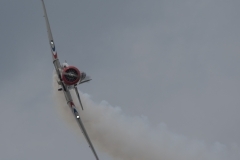 Absent of an airplane willing to challenge him to a race, Chris Darnell performed the signature act, with gratuitous use of smoke, afterburners, and the trio of Pratt & Whitney J34 engines. The World’s Fastest Semi Truck screamed down Runway 34 before coasting to a hault with parachutes in tow. On Saturday it appeared that one lucky (or crazy) individual was along for the ride in the passenger seat of the bespoke jet-powered speed machine. 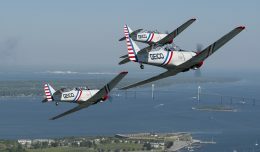 The Geico Skytypers took to the skies next and showed off their new demonstration to the Quonset Point airshow fans. 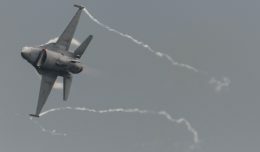 While many of the maneuvers were similar to previous years’, the team was able to keep action in front of the crowd and incorporate the solos more. The mock dogfighting between the Vic and Solo elements as well as between the Solos was entertaining to the assembled avgeeks. 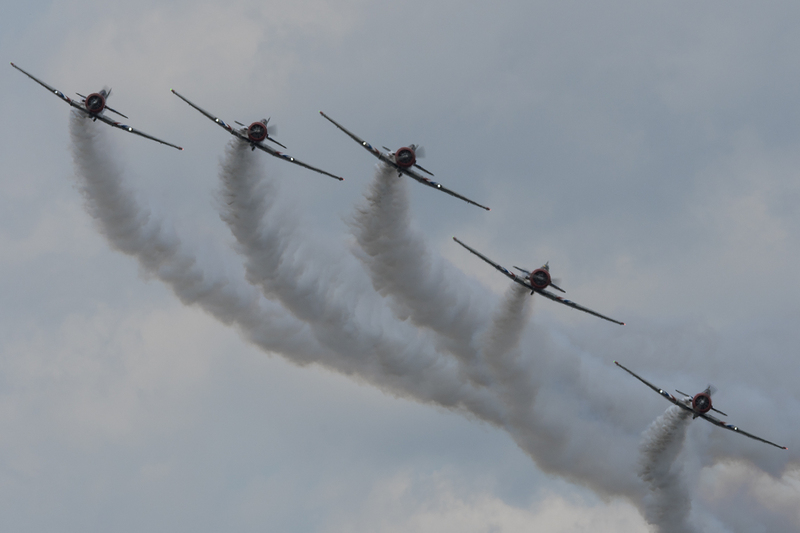 It is always great to hear a symphony of radial engines, particularly SNJ/T-6s with their distinct roar, and even better when it’s coming from a team that prides itself on professionalism and formation flying excellence. 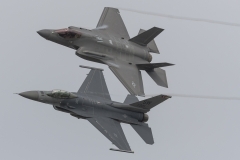 Though they performed with heavy hearts, returning to performing in Rhode Island and flying a safe demo is the best way to honor their fallen wingman. 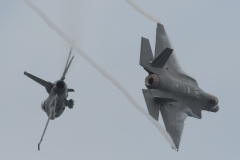 With the majority of the Quonset Point based 1st Battalion, 126th Aviation Regiment deployed in support of global operations, the traditional Joint Forces Display was put on hold. 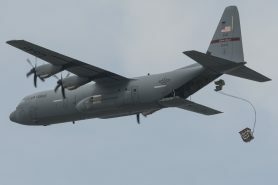 Despite this, the 143d Airlift Wing, the Rhode Warriors, demonstrated some of the capabilities of their C-130J Hercules airlifters. After dropping the Naval Academy parachutes from medium altitude, the C-130s put on a show of their own! The demonstration consisted of a few passes in addition to a live airdrop of a supply crate and a tactical landing with a Humvee offload. It’s always great to see the local units able to show the community just what the dedicated professionals in uniform do day in and day out to support and defend our nation. Following Maj. Water’s dedication pass, a perfectly timed barrel roll placed him in formation off the left wing of Andrew McKenna’s P-51. Capt. 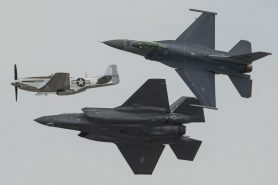 Andrew “Dojo” Olson was off the Mustang’s right wing in an F-35A, and the three aircraft representing three very different generations of American airpower performed the graceful Heritage Flight profile. With the nostalgic tones of “We Remember” filling the gaps in narration, the past, present, and future of America’s Air Force flew in tight formation, first in Vic, then Echelon, and finally breaking from behind the crowd before the aircraft all made pitch up breaks to land. 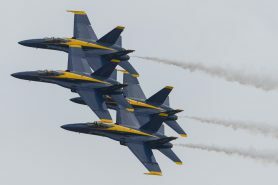 Waters, Olson, and McKenna took off once more after the Blue Angels’ demonstration to take part in a historical event. Heritage flight, led by McKenna in the Mustang, flew over Belmont Park prior to Justify capturing the Triple Crown. 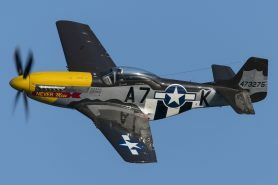 Aviation fans will be the first to dispute the victory though, as Andrew’s Mustang clearly crossed the line long before the Chesnut Colt. “Godspeed” and “Never Miss” in formation. The walk down memory lane continued as Mark Murphy took to the skies in “Never Miss” again. 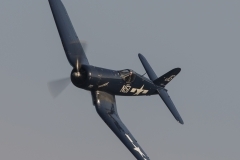 This time he was joined by the Corsair “Godspeed”, flown by Charles Lynch. 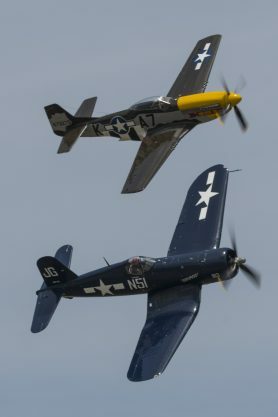 Rather than the simple formation passes from the morning’s TBM-Mustang flight, “Never Miss” and “Godspeed” engaged in a bit of tail chase sparring in the skilled hands of their pilots, simulating a small part of dogfighting that was so prevalent in World War II. After both aviators got their “shots” in, the pair joined up for formation flat and photo passes before recovering the beautifully restored vintage fighters. As soon as “Godspeed” and “Never Miss” cleared the active it was time for the full demonstration from New England local Michael Goulian. 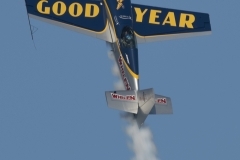 Over the next 15 minutes the Goodyear and Whelen branded Extra 330 SC tumbled through the skies in one of the most dynamic and complex monoplane aerobatic demos on the airshow circuit. 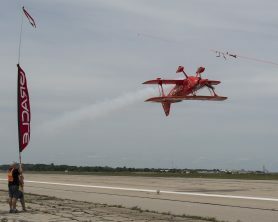 With the entire routine choreographed to a soundtrack, Goulian leverages his 30 years of aviation experience to demonstrate the crisp and aggressive flying that helped him become one of the youngest US Unlimited Aerobatic Champions. As of the time of this writing Goulian is tied with Matt Hall for the lead of Red Bull Air Race World Championship! A familiar whine of three J34 turbines starting up infiltrated the crowdline after Goulian landed. As Chris Darnell drove Shockwave down the taxiway kids of all ages pushed their way up to the crowdline for a better view. 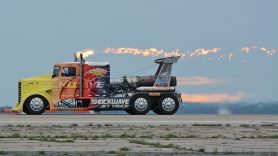 With smoke, fire, and a dash of showmanship, Darnell paraded the world’s fastest semi in front of the crowd before taking the runway. 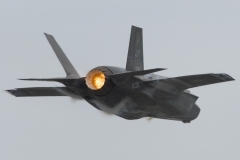 After generating a house-sized cloud of smoke, the afterburners were lit and the truck took off down Quonset Point’s runway in pursuit of speeds well over 300 miles per hour! Sean D. Tucker’s familiar Oracle Challenger III made a solo appearance after Shockwave. Sean’s act includes many extreme gyroscopic maneuvers and tumbles that are only possible when flying a customized extreme aerobatic biplane. 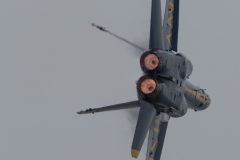 His signature style includes aggressive flying such as ungodly amounts of negative G during outside loop maneuvers, the world’s smallest inside loop, and flying backwards at over 100 miles per hour! Near the end of his demonstration Sean performs a series of ribbon cuts, first in right knife edge, then left knife, followed by inverted. After witnessing the right knife edge cut last year in Rhode Island, NYCAviation joined the pole holders for the inverted ribbon cut and got a runway-side view. 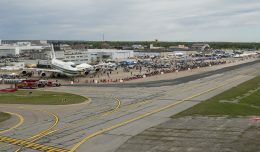 As a point of reference, typical show lines for an aircraft like the Challenger III are about 500 feet away from the crowd. In this instance our photographer had the pleasure of viewing the pass from about 50 feet away as the beautiful red biplane screamed by inverted at over 200 miles per hour, cutting the ribbon dead center before climbing away from the show line in yet another outside loop. It has been a treat to see Sean perform his solo routine as one of the premier civilian airshow acts in the world, and one can only hope the excitement of his current act can translate to the rumored formation performance. One thing is for sure, he’ll attack it with an unrivaled enthusiasm and do everything in his power to inspire the next generation of aviators! “Buzz” took Ace Maker back up as the penultimate act of the Rhode Island show. 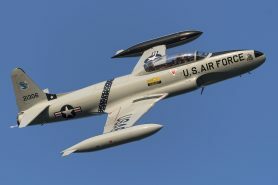 The former TACDEMO pilot has clearly been doing his homework, as he flew a demo profile in the signature style of experienced T-33 driver and Ace Maker owner Greg “Wired” Colyer. All too soon the classic jet was aerobraking after touchdown and the field was swept in preparation for the finale. 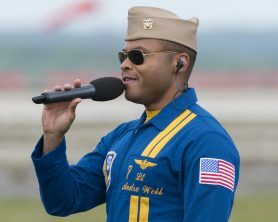 At precisely 2:15 the voice of Andre Webb, Blue Angel #7, filled the sound system as he introduced the US Navy Flight Demonstration Squadron. 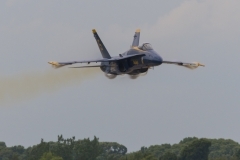 After the talented Blue Angel maintenance team went through their crisp preflight checks and the pilots cranked up the turbines, the six blue jets taxied out to start the show. Quonset Point provides a rare opportunity to be close up to the aircraft as they taxi out, and the pilots certainly liked having a slow roll past the crowd. 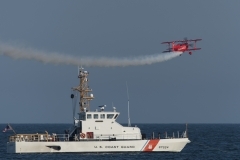 At many shows the pilots are little more than a spec in a cockpit, but Rhode Island gives everyone a chance to see the men and women behind the machines. Big smiles, fist pumps, and creative waves were the order of the day as the team interacted with fans the best way they could from inside the cockpits. When the team slipped the surly bonds the spectators were in for a treat. Despite it being relatively early in the season, it seemed to this airshow enthusiast that the team was in mid-late season form. The Diamond 360 and Echelon passes were flown very tight, and the line abreast maneuvers had a minimal amount of movement between the jets. Best of all, the sneak pass was low, fast, and had plenty of vapor for those lucky enough to get a few shots in focus! 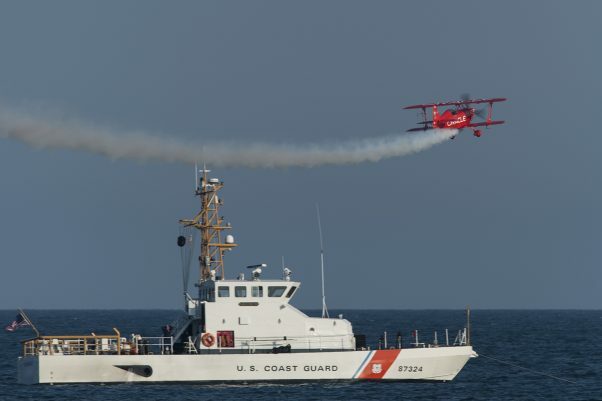 As usual, the team did an excellent job of demonstrating the dedication and professionalism of the Navy and thrilled the crowd from start to finish. As the canopies opened, the turbines spooled down, and the Blue Angels walked away from their jets in formation another successful Rhode Island National Guard Open House & Airshow was in the history books. 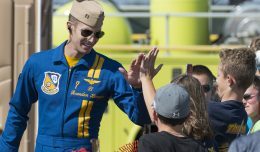 Quonset Point will play host to another show in 2019 as the Air Force Thunderbirds come to town June 29th and 30th. 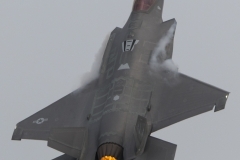 The author would like to thank the Rhode Island Airshow public affairs team for once again showing that they’re among the best in the business. 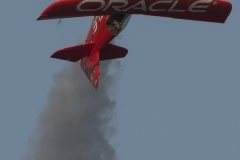 Additional appreciation is extended to Brandon Hess, and Johnny De Gennero of Team Oracle for their assistance in once again providing NYCAviation with an unrivaled view of Sean’s performance. 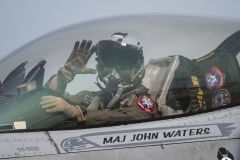 A final word of thanks is owed to Maj Waters, TSgt Dizes, MSgt Schneider, SSgt Armstrong, TSgt Mullins, and the Viper Demonstration Team for their hospitality, enthusiasm, and assistance in acquiring the footage that accompanies this article.